Why there is a need to protect wildlife? The theme of this year’s World Environment Day was zero tolerance to poaching of wildlife. For many people, showing concern for wildlife is redundant in view of the large number of people living below the poverty line in India. In a deeper analysis, it will appear that protecting wildlife is vital for the present as well as future generations. Life in the wild promotes biological diversity, which in turn, provides materials for food, clothing, medicines, papers, beverages and spices for daily use. From the days of the hunter-gatherer—when hunting animals and gathering fruits, tubers and herbs sustained humans—till the present time, human society, without even being aware of it, always depended on nature. Science helped us to understand the extent of diversity in the wild, study life cycles, domesticate wild species and breed, cultivate and trade them. Technology helped us add value and extract maximum profit from the use of natural resources. Biodiversity was finally recognised as the sovereign right of every country in June 1992 at the United Nations Conference on Environment and Development, Earth Summit, in Rio de Janeiro, Brazil. Till then it was an open-access free resource, largely taken from technologically-poor south to the tech-savvy northern countries. India had a gross domestic product of 25 even in the 16th century only through trading products of living natural resources such as silk, cotton, spices, indigo and so on. The Convention on Biological Diversity signed by more than 190 countries till date for the first time not only announced the sovereign right of each country on biodiversity, but also made it clear that the provider country must get for giving access to the resources from the receiver country. In 1972, India enacted the Wildlife (Protection) Act, but it only provides different levels of legal protection to scheduled species—at different levels from schedule 1 to 5. While Schedule 6 enlisted very few plant species or group of plants like Orchidaceae, it failed miserably to protect other endangered plant species. The Botanical Survey of India has published four volumes of Red Data Book on Indian plants, but the Act failed to take advantage of that. Because of its value, wildlife is poached illegally and some the species have been brought under the network of the Act. Ivory, tiger skin and bones, leopard skin, rhino, otter skin and products made out of hair from wild animals (such as paint brush from mongoose hair) are the most illegally traded wildlife. TRAFFIC India, the wildlife trade monitoring network and the WWF are helping track down illegal wildlife trade. The customs department is responsible for intercepting any consignment containing illegal wildlife trade products. India’s porous border with Nepal, Myanmar and Bangladesh is often used to transport such products. 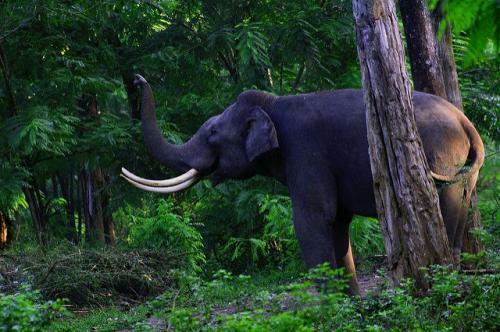 India has more than 600 Protected Areas (PA) to conserve wildlife. Most of the poaching occurs within the PAs—at one point the Panna Tiger Reserve had no tiger, all being poached. The highest numbers of rhinos are poached within the sanctuaries. The major reason is inadequate infrastructure, lack of noctavision binoculars, lack of sniffer dogs and lack of modern firearms and vehicles to apprehend the poachers. Poachers are often better equipped and alert. India has set up 47 tiger reserves. A study for six tiger reserves to provide qualitative and quantitative estimates for as many as 25 ecosystem services were made by the Centre for Ecological Services Management and the Indian Institute of Forest Management, Bhopal. The study indicates monetary value of benefits from selected services range from Rs 8.3 to Rs 17.6 billion rupees annually. “In terms of unit area this translates into Rs 50,000 to Rs 1,90,000 per hectare per year. In addition, selected tiger reserves protect and conserve stock valued in the range of Rs 22 to Rs 650 billion.” (Verma, 2015) The data from the Sundarbans Tiger Reserve in West Bengal is worth quoting. So, from one unique conservation area more than Rs. 60,000 crore worth of benefit is derived. Ultimately, it is the human society that benefits from wildlife.